640 pages | 8 Color Illus. | 345 B/W Illus. 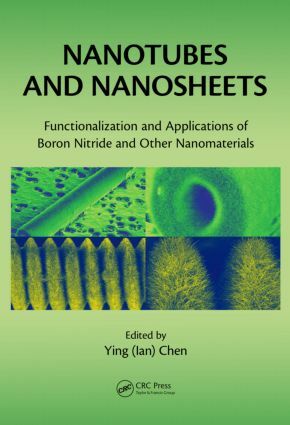 Nanotubes and Nanosheets: Functionalization and Applications of Boron Nitride and Other Nanomaterials is the first book devoted to nanotubes and nanosheets made of boron nitride (BN). It shows how the properties of BN nanotubes and nanosheets have led to many exciting applications where carbon (C) materials cannot be used, including high-temperature metal-ceramic-based composites, substrates for graphene and other semiconducting layers in electronic devices, reusable absorbents for oil and other contaminants, dry solid lubricants, and biomedical applications. Researchers working on various aspects of BN nanomaterials share their knowledge and current work on the applications of BN nanotubes and nanosheets. They describe numerous applications, including BN nanotube-reinforced metal-ceramic-based composites, field emission, desalination, cleanup of oil spillages, biosensing and bioimaging, drug delivery, biomedical applications, and energy storage using BCN and TiO2 nanorods and nanosheets as electrode materials. The book also covers C and other nanotubes and nanosheets to give readers a broad view of the latest nanomaterials research. "This textbook is likely to become ‘the handbook’ on boron nitride nanomaterials. Researchers working on classical carbon nanotube and graphene-based materials will also benefit from taking a closer look at developments in the emerging field of boron nitride nanomaterials." "This book gives detailed insight into the exciting field of boron nitride nanostructures. It is most definitely one of the most comprehensive books of its type in this field and well worth reading." "… an excellent information source on the state-of-the-art status of boron nitride (BN) … a handy knowledge bank to get to know BN and seek potential ways of using it." Professor Ying (Ian) Chen is the chair of nanotechnology at the newly established Institute for Frontier Materials at Deakin University and node head of the ARC Centre of Excellence for Functional Nanomaterials and a member of the College of Experts of the Australian Research Council. A world-renowned expert on nanotubes and ball milling, Dr. Chen invented the ball-milling and annealing method for mass production of boron nitride nanotubes, which led to the world’s first commercialization of boron nitride nanotubes in 2002. Professor Chen contributed to three bestselling nanotechnology books published by CRC Press. His publications have also been cited more than 3,500 times in the past 10 years. He is a fellow of the Institute of Physics and a member of the American Physics Institute, the Materials Research Society, the Australian Materials Union, and the International Mechanochemical Association. His research focuses on nanomaterials for energy storage (batteries and capacitors), environmental protection, and medical applications.